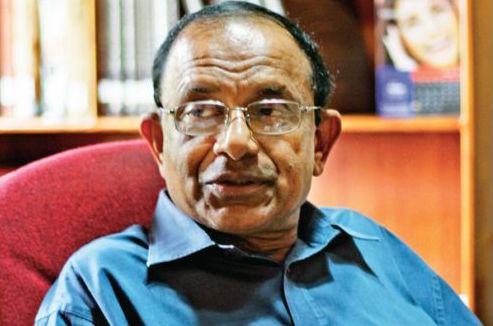 UNP National List MP Kodagoda Hitige Jayampathi Rohanakumara Wickramarathna alias Dr. Jayampathy Wickramaratne PC who was a vociferous campaigner against the corruption of the Mahinda Rajapaksa led former regime has been accused of selling his duty free car permit. Jayanpathy is also a politbureau member of Lanka Samasamaja Party (majority group) and the Parliamentary Secretary to the Prime Minister Ranil Wickremesinghe. On February 13, 2017, Rs 95,27,562.50 ( USD 62,500.00 X 152.4410) worth a brand new Toyota Land Cruiser was imported using Wickramaratne’s duty free car permit by Bestair Services (PVT) ltd. The vehicle was registered with the Commissioner of Motor Traffic on June 14, 2017 and transferred to the name of the vehicle permit buyer Yaden International (PVT) ltd. on August 22, 2017. 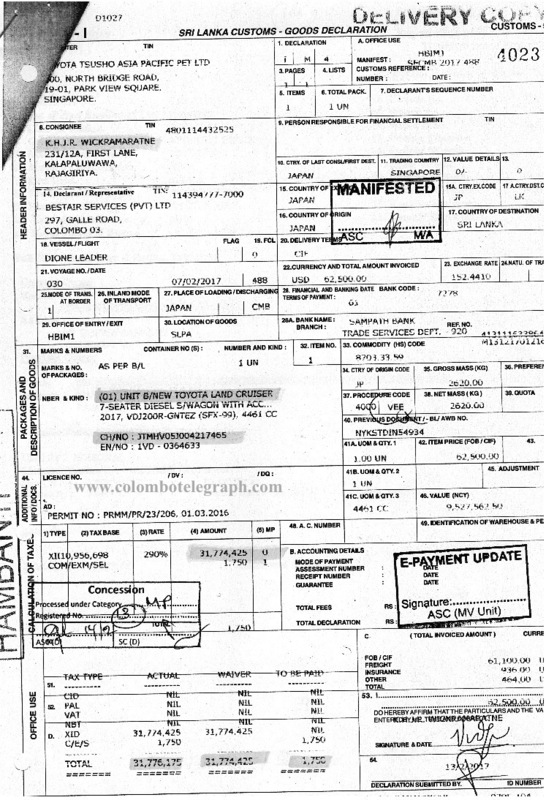 According to the custom’s declaration form the total tax waived off for Jayanapthy’s vehicle is Rs 31,774,450.00. Whoa, whoa….just a second please! The problem is not with Jayampathi, or whether he is from LSSP or CP. It is with the system that provides this license to effectively steal from the public coffers. Why give MP-s car permits? To facilitate their electoral work (they say). Why do they sell the permits and make lots of money? To facilitate them entertaining their constituents at ‘home’, giving them tea and other refreshments (they say). So it seems that our bunch of MP-s are grossly underpaid. Don’t the PM and President know that if someone is underpaid, the solution is to provide them with an incremental allowance for the specific purpose, rather than do it in this underhand, devious and ultimately criminal way? 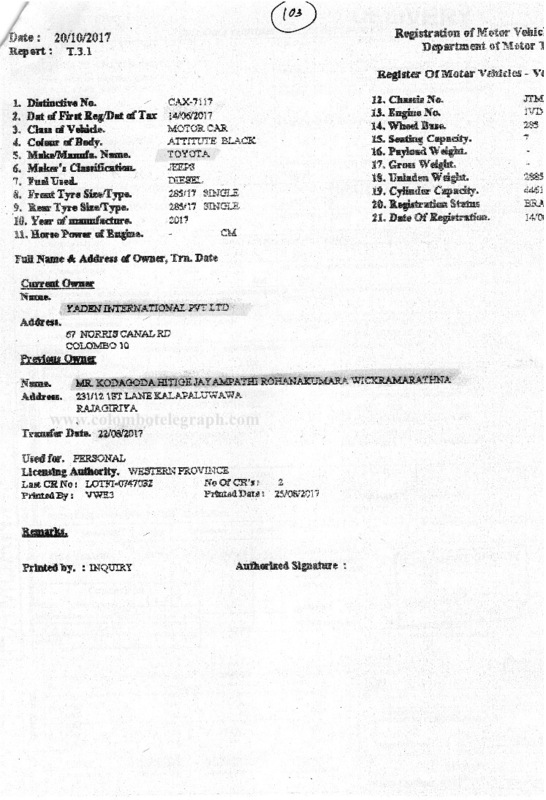 Ranjan Ramanayaka was correct that 90 percent of lawyers are corrupt in Miracle of Modayas! Bondscam Ranil Wickramasinghe and his jarapalanaya regime cronies are responsible for the political culture of impunity and immunity for corruption enjoyed by the clowns in the Diyawenna Parliament. Ranil Wickramasinghe must be impeached for rampant political corruption that is rotting the body politic and social fabric of Lanka today. UNP National List MP Kodagoda Hitige Jayampathi Rohanakumara Wickramarathna alias Dr. Jayampathy Wickramaratne PC Caught With Pants Down For Selling Duty Free Land Cruiser. He just made use of the culture of impunity bestowed. He gets his piece of cake. The silent majority of Lankans earn their daily bread and parippu honestly. The only requirement to stop such misuse of perks is the will to put a stop. If this was done by any member of former government, by now they would be facing inquiry at FCID. I am sure nothing would happen to Wickremaratne because he is a crony of the Yahapalanaya government. Can anyone please confirm whether selling a duty free car permit is against the law? I seem to remember some new regulation or law that permitted it. I am not asking whether it is a good or bad thing; that is not my question. I would like a precise answer – does it violate any law or regulation? Thanks to anyone who can clarify. Golding the correct position is as follows. During MR’s time (2012-13?) there was a concerted attempt by the Customs to stop the illegal sale of duty free imported vehicles. Many finance companies which were found to have duty free permits in possession were sealed and this affected big MR supporters like Dhammika Perera (Vallibel Finance, LB Finance, etc) and Ishara Nanayakkara (LOLC). MRs response was to transfer the Customs Chief Dr Neville Gunawardena and introduced a regulation (backdated for several years) regularizing sale of duty free vehicles. I believe the regulations are still in force. It is illegal to sell permits (vehicles have to be imported in permit holder’s name) but immediate sale of vehicle after import is permitted. The solution is for the permit holder selling the permit and handing over a power-of-attorney to the buyer to be restricted in all matters connected with the import vehicle . I don’t trust most politicians – this is why. Well, indeed that law of land has created New Classes of politician by given unlimited perks and duty free privileges by 1977 UNP-JRJ ? Last 40 years all ruling parties( UNP SLFP JVP & TNA MC ) in favors of has instead of Curtailing of these privileges, that they have increased & upgrade one by one that funding of TAX Payers Money? This key role of ongoing being enrich by UNP Ranil Wicks after 2015 January 8th . The time to time passes the several supplementary budget by Majority of two-third members of Parliament has given more Cash in Hand to MPs from the Public Treasury. The MPS of all disregarding political roots which all members of House has become that buying and selling of Brand New Cars. By the cost Poor people labor of vast majority are living in 60% in below poverty line an Island wide. Additional to that Duty Free Cars there are Huge Pay packet for MPs. By Nation Pension schemes ,staff of Family members , Housing allowances, Health Care Insurances and other privileges go oversees by govt. funded including family members are few of perks they are entitle. These are politically bribes of corrupted certain roots of encourage Members of House to are wrong doing in politics ? No body raise question about that any quarter of Political parties or their leaders in Chamber which that roots bribes of politics ? Democracy has corrupted by UNP and SLFP and JVP,LSSP, Communist of Party’s MPs last 40 years? Most of corrupted practices are accepts that Democracy of Parliament in Sri lanka by headship of Political Parties . This is nothing new or surprising. This reminds us of the good old sinhala saying , pardon me I don’t have the soft ware to reproduce it. You may get an idea of my crude English translation. ” If the bag of flint is also moth eaten just throw away the bag of rice without even opening it”. The pertinent question is are we prepared to do it. Your guess is as good as mine. These vultures are getting ready to be born again with altogether a new baptismal garb. There will be enough acolytes to hold lighted candles singing hosannas and sadu, sadu. He will have to pay for it.Were any of these happenings made public earlier on although everyone knew it was happening?! Jaya W is not known for his integrity. The guy was caught cheating at the University Finals exams and expelled from the University. Then he did Law!! Now he claims to be an expert on the Constitution. Like most of the other ex-Marxist careerists, like David, Bahu et al, he has found his place as an advisor to the UNP and the national list..
You cannot expect more than this from a person who was sacked from the University for copying during an examination. This Jayampathi Wickramaratne was a University student at Peradeniya in 1970’s and he was caught together with some other guys for copying and was sacked. Then he did law and became a lawyer. These are the people who are involved in constitutional reforms in this country. This country has gone to parayas!